376 pages, with over 100 unique recipes, to make your detox time interesting, tasty and fun!! Do you wish you could achieve your natural weight, have abundant energy and gain a clear mind? "Shazzie should be everyone's guide and mentor while detoxing." "I started my raw vegan life about 2 weeks ago following your 1 week detox diet and things are more than wonderful. I used to have horrible horrible acne and have been on antibiotics for years. I have been on any and every antibiotic you can imagine and still no improvement. Well, in just 2 weeks, since following on your raw vegan footsteps, I already see an improvement: no more new acne heads and the existing ones drying out. You can not imagine how much I want this to continue. Your raw vegan lifestyle changed everything in about 2 weeks. So happy to be RAW VEGAN. I can not tell you how much I enjoy the food (the cakes in particular) and I do not crave anything of the old "food"." You'll love the detox plans which soothe your soul. You'll delight in the 100+ unique detox recipes. You'll be lifted to new levels with the detox helpers. You'll be inspired by the success stories. You'll learn which foods can make you feel great -- for the rest of your life. You'll love this book as much as it already loves you! Check out the author Shazzie before and after detoxing her world. Within these pages, she explains in simple terms how you can become the person you are destined to be. Are you ready to learn nature's time-proven health and happiness secrets right now? Detox Your World is 376 pages, with over 100 unique recipes, to make your detox time interesting, tasty and fun. So you can choose how to detox, there are several detox plans, including the weekend detox, a juice cleanse, a chakra rejuvenation detox, how to fast safely, and a Detox For Life plan. Be inspired by the testimonials -- real life people writing honestly how they lost weight, lost their illnesses whilst gaining confidence, direction and joy in their lives. Find out the truth behind all the dangerous things which are considered safe by most, such as mercury fillings, vaccinations, and cooked food. Get that extra incentive to quit smoking or drinking, by reading the hard hitting facts alongside new solutions to break addictions and habits. Delight in the Detox Helpers chapter -- many luxurious ways of making your detox quite heavenly. There are also details on emotional detox techniques such asvipassana, laughing, and a secret set of exercises practiced by Tibetan monks! Much more resides inside the cover of this comprehensive guide to detoxing your world, as you will see from the table of contents. What's all this detox business? What's the best way to eat food? Once I'd discovered that the secret to a fantastic life was to detox my world, I can only describe the subsequent changes I experienced as magical. I became my natural weight, lost all sight of depression, gained a new outlook and direction in life. For the first time ever in my life I was truly happy, healthy and wise. It's the wisdom I've learned that I want to share with you in this book. You might find some of the facts unbelievable -- if you do, try out my accompanying suggestions and make notes on how you feel. That's the only way to know whether to believe I've really found the secret to living life joyfully and in harmony. When I realised this wasn't just a physical journey I began to take an interest in yoga, which took me further on my own personal development path than I thought possible. I also discovered a simple set of ancient exercises used by Tibetan Buddhist Monks which really do turn back the clock, and I share those here with you, too. What you have in your hands is everything that I've learned about detoxing naturally. A natural detox is important, as it keeps us in an "earth rhythm" that stops us feeling separate and isolated from all around us. Many of today's problems in our society (and increasingly the whole world) stem from feelings of disconnection. Re-establishing that connection with nature gives us more power to live the life we've always wanted, while creating a sustainable and responsible way of living. If you've eaten a typical western diet (meat or vegetarian) all your life, you will have taken in more toxins than your body can remove. Eventually, you may start to feel under the weather or ill. The illness can take many forms, such as acne, arthritis, depression, heart disease, lethargy, menstrual pains etc, but the cause remains the same: your body contains too many toxins and is struggling to expel them, because it wasn't designed to deal with such a high intake on a permanent basis. By lightening your diet and other toxins that surround you, you allow your body more freedom to remove stored toxins. Your body will thank you by giving you more energy, healing itself of diseases, and clearing your brain so that it's cobweb-free. In the UK, about 99% of non-organic farm animals are now fed GM soya products. That's another reason for taking a fresh look at the meat on your plate. When detoxing, you are not denied lovely food. If you like, you can even have pudding for every meal! Eating your favourite fruits, getting massaged, having saunas, swimming, playing and practising yoga sounds more like a pampering health farm than a strict regime, doesn't it? Eating detox food is certainly not going to make you feel confined to a life sentence of boring food and hard exercise. I will reveal how this simple way of life can provide you with great health benefits as you read through the sections of this chapter. As you eat more food which has a built in feel-good factor, it becomes easier to believe that it's possible for you to step into your magnificence. Pesticides, herbicides and other agrochemicals shouldn't be in our food — they are poison. Fibre, protein, cabbages and eggs! I grew up amongst the F-Plan, Weight Watchers, Slimming Club, The Grapefruit Diet, The Egg Diet, Slim-Fast and The Cabbage Soup Diet. At any time, at least one member of my family or friends was trying them out. Most of them lost weight. None of them kept the weight off. I quietly observed the yo-yoing of my loved ones, while pondering "There must be a better way". These days we have the Atkin's, Zone and Blood Type diets. We also have many dieters thinking: "Maybe as the old diets didn't help me keep my weight off, then these new ones will?" Over 50% of American and British adults are now overweight or obese. After her earlier "little gem of a book", Shazzie's Detox Delights, I couldn't hide my anticipation as I ripped open the lovely package that enveloped Shazzie's latest book, Detox Your World. Shazzie honestly and wholeheartedly shares all that she has learned along the way through her own experiences with nothing held back -- what a refreshing change. Always looking for approaches that connect us with our natural rhythms, I was pleased to see that this theme was stressed throughout the book. As anyone knows who has ever attempted a detox, it can be both a joyful and a stressful time. Here's help to keep you on the right track! Beginning with a simply laid-out 'how to' of this book, step-by-step plans are offered geared toward the desired goals that you wish to achieve. What is the 'detox white lie'? What are the benefits and side-effects? What really happens when you detox? Let Shazzie explain to you what it's all about. What could be simpler than a short detox to give it a try and see how you feel? What do you buy? How do you go about it? What about the emotional issues? Relax... Shazzie helps every step of the way. More advanced in detoxing? Then try her 'Seven day chakra rejuvenation detox'. The emphasis here is on meditation coupled with cleansing and rejuvenation rites. How can you go wrong with delights like 'Squash and kumquat soup', 'Thai salad', 'The candy floss tart' juice, 'Rocket fuel' juice and others to choose from? During 'Your juice detox', enjoy other juices like 'Wake up, ginger', 'Cucumber number', and 'Sangria Maria'. Ever thought about fasting? Who shouldn't fast? What to be aware of before you undertake one? Shazzie's tips will help you decide if it is possibly for you. Have you always been a bit of a free spirit and like to dance to your own groove? Then pick from the 'detox helpers' such as yoga, breathing, meditation, skin brushing and others. Learn why you should be concerned about water, air, toxins, household cleaners, skincare, environmental pollution, alcohol, and coffee. If, after all the improvements that you've made over time, you feel ready to jump to the next level, then follow Shazzie's 'Detox for life' plan. The helpful food and equipment notes will make whipping up all these 'Detox wonders' easier. 'Coconut drink', 'Seaside smoothie', 'Bottoms up' and 'Fractal fortnight' juices, 'Melonlemon', 'Cardamom cooler', and 'Chockie milkshake', will quench your thirst, nourish your body and satisfy your emotions. 'Cream of shitake' and 'African spicy sesame' soups, 'Chakra' and 'I can't believe it's not Waldorf' salads, scrummy side dishes such as 'Onion bhajis', 'Fried' mushrooms, and 'Shazzie's chip shop chips' will leave you with no excuse not to try these easy to prepare dishes. Have diary products always been your weakness? Then lick your lips on 'Macadamia cream', 'Cheddary cheeze spread', or 'Vanilla crème'. Try 'Spinach pesto', 'Mushroom gravy', 'Sunflower pate', or 'High vibe dressing'. Want to impress someone special? Watch them "Oooh and Aaahh" as they marvel at your 'Walnut burgers', 'Earth and fire sushi', 'Butternut noodles with golden curry sauce', and 'Corn tortillas'. To even further outdo yourself, let them be tempted with 'Smooth coconut ice cream', 'Toffee and raspberry fool', or 'Kumquat and nutmeg cheezecake'. If all this useful information is not enough inspiration, then turn to the 'Success stories' where real-life people talk about how they now go for the gold each and every day of their lives. Even though many of them have had serious illnesses like: fibroid tumors, thyroid disease, irritable bowel syndrome, rheumatoid arthritis, and asthma, they have been able to miraculously 'recover' by changing how and what they eat, and don't eat. You can also turn your world upside down and begin a brand new life. Our bodies need a good detoxification. We've eaten junk for much of our lives, and if you change your ways, you'll love the results. But real-world eating is not about don'ts; it's about do's. Shazzie's book is so positive, so effervescent and yet down to earth, that I think you will be quite cheerfully drawn into doing right by your body. What is that, exactly? Eating raw foods and juicing, of course! 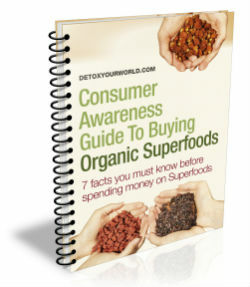 Detox Your World is about the many, many benefits of the raw food lifestyle. Drs. Herbert Shelton, Norman W. Walker and Ann Wigmore would approve of every word. Detox Your World is an especially apt title because our skin is only a rather arbitrary boundary between our inside and outside worlds. Internal and external ecology, our internal body and our external environment, are really one in the same. Shazzie's comments on colon health and skin care serve to highlight this point. If there is a heart to any how-to health book, it is the "here's what you do each day" section. In Shazzie's book, this probably would mean pages 166-176 and 190-199. There you will find a goodly list of good foods that you really need to (and will actually want to) eat. I'm glad to see peanuts conspicuously recommended, and cows the world over will be dancing in their stalls when they see the no-dairy recommendation. Personally, I think cooked lentils and beans should be included as highly desirable foods, especially for the majority of people that will not be going 100% raw. And for those that do, my experience is that freshly-sprouted lentils are an excellent food. Shazzie addresses, if briefly, our misconceptions and worries about not getting enough protein from raw foods (p. 145) and provides fasting how-to's that I can confirm are highly effective (p. 224-226). I also liked the way she properly debunks our obsession with breakfast (p. 183). Excellent and concise juicing hints are provided on pages 140-141. Additional recommendations include getting into massage, exercise, meditation, and (my personal favorite) turning off the television (p. 75). Detox Your World suggests keeping a health journal "because you will change so much that you soon won't remember how you used to look, act and feel." (p. 36) But can you do it? Does it require nerves of steel? Not at all. "Willpower does not come into it," Shazzie writes. "This isn't about trying to convince yourself of anything; it's about changing yourself so you don't see that cream cake as food anymore." (p. 24) Closet cream-cake junkies and most other readers in transition will benefit from the success stories (p. 238-270) and welcome the many really appetizing recipes (p. 271-344) that fill out the balance of the book. Academics and other skeptics might appreciate it if Detox Your World included references to supporting scientific studies. A book that is this attractive and well put together deserves frequent and proper citations to the medical literature to back up its assertions. But on the other end of the reader spectrum, I think a cartoon illustrated version of this book for kids would be a big hit, kind of a "Cat in the Hat Detox" or "The Berenstain Bears Go Juicing" sort of thing. I loved the book's "before" and "after" pictures and would like to see dozens of them in the next edition. I also recommend an expansion of the book's bibliography, with complete publishing information for readers that really want to track down, borrow or buy recommended books. Title and ISBN are a good start, but are really not adequate to present to a busy librarian or the average bookstore clerk. I support the book's criticisms of vaccination, fluoride, amalgam (mercury) dental fillings, alcohol, coffee and smoking. And while I disagree with Shazzie's negative view of megavitamin therapy (p. 30), I heartily agree with her fundamental and absolutely correct emphasis on achieving health by eating a tasty, varied diet that is 75% (or more) fresh and raw, munched with joy. To me, megavitamins and the detox diet are a marriage made in heaven. I shamelessly recommend both. I very much like Detox Your World: it is practical, detailed, warm, enthusiastic, and just plain true. Some books brighten your day; here's one that will brighten your whole life. Reviewed By Dr Andrew Saul. We thoroughly recommend you subscribe to his Doctor Yourself newsletter for an overflowing amount of great health tips. Dr Saul also has a new book out, called DOCTOR YOURSELF: Natural Healing that Works. We give it five stars, and hope you enjoy reading it and learning from it. Are you ready for a whole new you? I certainly was, towards the end of last year, but I'll tell you about that later. This book wasn't published then -- it’s brand new, I wish it had been around as it's the best all-round source I've found of the information you need to enhance your health and happiness by removing dietary and environmental toxins. 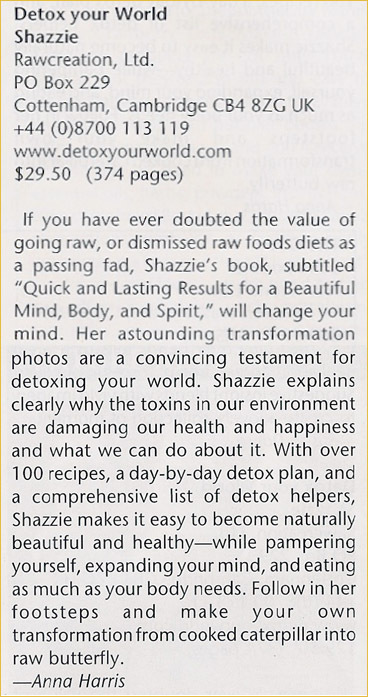 The author, Shazzie, is a living example of the profound changes that thorough and consistent detox can achieve. "Is that Shazzie?" my little girl asked, pointing to the photo on the back. "Yes it is." "Then, Who’s that?" (pointing to the unrecognisable 'before' photo). Shazzie started detoxing her world more than 3 years ago, so she writes from a position of learning and experience, and is rapidly becoming known as a world authority on detox diet and food preparation. ...Amongst many other sources you need to consider. But it’s not a 'scare yourself silly and seal up the underground bunker now' type book, it's about making positive choices for your life. In addition many 'detox helpers' are explored -- other things you can do for yourself to enhance or accelerate the process if you so wish, from colonics to the Tibetan Rejuvenation Rites! But the emphasis is on simple, practical steps that produce big changes -- such as breathing properly, skin-brushing and exercise, as well as treats like massage and meditation. All of the information is presented in a friendly and accessible style that presents alternatives and ideas -- I found it very undogmatic and a lot less 'preachy' than many diet/lifestyle manuals. Shazzie presents the benefits and reasons for making changes, and provides suggestions for making different-sized steps according to what YOU are ready for. Several 'detox plans' are included in the book, in case you want to kick-start your lifestyle changes with a highly structured programme -- such is the essence of this kind of book after all. You can find information about juice detoxing, 3 day system recharging, or a 7-day chakra detox, which would be a very powerful way to lighten your diet and your mind. But the majority of the chapters are about making informed sustainable changes to your life in general, that can bring long-term benefits to your happiness and wellbeing. I first became interested in detoxing in a big way around the new year, and at that time you couldn't move for detox products, articles, diets, manuals, programmes etc -– all working on the principle that you can treat your body like a rubbish dump for 11 months of the year, then live on lettuce and lemon juice for a month and set it all back to rights again, only to return to the same cycle of self-abusing behaviour once you finish the programme and you are magically 'detoxed' -– this is madness! No wonder so many diets fail. If you are looking for yet another glossy manual to set you unrealistic ideals that are likely to leave you less motivated than before (and quite possibly with a severely mucked-about metabolism) then this is not the book for you. Detoxing naturally is not about starvation (although controlled fasting is explored briefly and can have great therapeutic benefit), and it's not about vitamins, supplements or replacing food with something weird and unnatural. If you eat a balanced, varied and good quality diet you will get the nutrients you need, in the most bio-available combinations, rather than in tablets/capsules bound with god-knows-what and quite possibly lacking something essential to help your body get the most out of it. Science has discovered a tremendous amount about diet and nutrition, and the different elements in living foods that we need to keep us healthy, but the mere fact that new nutritive components are being discovered constantly (e.g. the recent fuss about phytochemicals) indicates that science does NOT have all the answers. Nature has been nourishing us for millennia, and presenting us with food that is desirable/flavourful, containing exactly what we need in the right combinations. I know which I am more inclined to trust. Lots of information is presented about food, in addition to the recipe section at the back, you can learn to chose healthily and deliciously every time. Shazzie is realistic and practical too -– recognising that you may not be able to afford or access everything you would prefer to buy organically for example. I found it invaluable to know which foods were less likely to contain contaminants and therefore be relatively safe to eat from a non-organic source (and conversely, which things are sprayed a dozen times to drag them through the factory-farmed conditions they are submitted to in order to get them to our supermarkets a few pence cheaper). 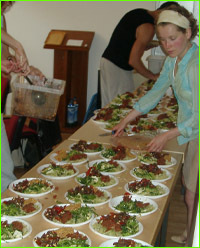 A lot of people in the living foods movement are also very pious about food combining and mixing too, and again Shazzie is pragmatic here -– whilst acknowledging and presenting the benefits of mono-eating (where you eat a single type of fruit, for example, for a whole meal) she also offers fantastic and flavoursome combinations that you can prepare for entertaining or your own pleasure. So many diets I had tried in the past I found restrictive and positively BORING, but there is so much to try here you will really enjoy experimenting. But it’s important to point out that what is being proposed is not a diet plan: far from it. The simple fact is, if you eat these kind of foods, simply prepared and from the freshest and ideally organic produce, you will introduce fewer toxins into your system than before. If you eat a good proportion of them, you will take in toxins at a lower rate than that which your body can excrete them, so you will start to detox. The rate of your detox is totally up to you and within your control, an empowerment rarely offered by dogmatic commercial diet plans. When I got started, without the benefit of this book, I was my typical 'go for it' self and ate 100% raw vegan for several weeks. The results were dramatic, but for me the lifestyle was not sustainable, and over the past few months I have yo-yo'd dramatically, settling now at a high-raw (70-80%), mostly vegan diet that suits me well, without severe restrictions or drastic detox effects. It's all about making it work for you. And it is working for me. Last year wasn't great in many ways –- stressful work situation, the collapse of relocation plans, one health scare after another, and pushing 13 stone (182 lbs). I was subject to regular migraines which seriously disrupted my life, and on daily medication for gastritis and my thyroid. December brought things to a head, with a biopsy on a throat lump that really scared me, followed by the sudden deaths of two people I cared about –- one from long ago, one I worked with daily, both well before their time from conditions aggravated by if not directly attributable to lifestyle. I looked at my little girl and how much I was needed, and realised that I had a choice. It was my body, and up to me to take responsibility for it. 5 months on I am stronger and more flexible, practising yoga regularly. I have lost 2 stone (28 lbs), and I can run across the park with my little girl. My antacids are a thing of the past, and my thyroid medication is currently being reassessed. I wish I could say that my life had become less stressful -– far from it: The last few months have brought me further hassles with the house, the loss of a beloved pet, indecent assault and a cranking up of the pressure at work, but the point is I am pretty confident that had this happened a year ago I would have been hospitalised by now with yet another stress-related syndrome. Detoxing has made me better able to cope with everything, and given me more energy with which to do so I think the yoga has made me more accepting – some things in life you cannot change, and if you know this to be the case you can choose not to waste energy worrying them, instead diverting that energy into something positive and life-enhancing. I am far from fully detoxed and I know it -– the only permanent changes I have made in dietary terms are cutting out meat altogether, and quitting a serious addiction to Diet Coke. I wince when I think of the 5+ cans a day I used to glug down! But I am learning to listen to my body and understand its messages –- if I eat an additive-laden meal I will feel rough the next day, even rummaging in the bin for a Zantac. If I eat tons of fruit and no greens I will feel high and speedy, sometimes that’s a good thing other times it’s not so better fix a salad! If I have a lot of mucous on my chest or sinuses, I can totally cut out the dairy for 3 days and it will just vanish. If I am detoxing too fast and feel ill, I can consciously decelerate things with a glass of wine before bed instead of a cup of tea, the point is that for the first time in my life I AM IN CONTROL, instead of feeling I am a victim of circumstance and a body that is tired, bloated and sickly. Anyway to return to the book (there are plenty more dramatic life-change biographies to motivate you there too, including Shazzie's own). If this had been published in January I believe I would have found it invaluable in helping me structure my approach to detox, and answer so many of the questions that I had. I recommend it to anyone interested in lightening their life, whether to address health issues, weight control, emotional wellbeing or all three. Shazzie self-publishes through Rawcreation, and it can be ordered online at www.detoxyourworld.com – where you can also buy a range of other products that will help you on your journey, from videos to superfoods. I have ordered a number of products from Rawcreation, and can reassure you that although you may not have heard of them amongst the big online shopping companies, their customer service and standards are second to none -– I once had a problem with a faulty item, which I advised to them by email that afternoon, the next morning a replacement had arrived along with a complementary recipe booklet long before I had managed to pack up and return the faulty one. This company genuinely cares about their customers and their wellbeing. 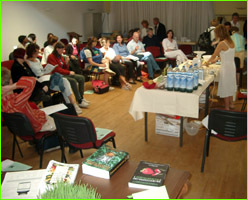 If you ever get the chance to hear Shazzie speak or to attend one of her living foods preparation sessions, I can wholeheartedly recommend that too, also a visit to her other website www.shazzie.com -– as well as details of forthcoming events and news you can ready Shazzie’s online journals of her own detox journey 3 years ago. She is a warm and vibrant person who gives generously of her experience and enthusiasm. So I challenge you all -– are you ready to begin to Detox Your World? Not everyone will be, and it’s all about timing too, but if any of the above has struck a chord then do check out Shazzie’s amazing book. With the abundance of detox books on the market, we decided to stock this one as we consider it the best around. Shazzie follows up herDetox Delights with this excellent tome, based on her own experience and substantial research. From a clear explanation of the need to detox, Shazzie takes us on a step by step guide through the whole process, answering many questions along the way. She isn't afraid to use her own experiences which help make this book more relevant than many of the other more scientific detox books. In her inimitable and reasurring way, Shazzie fully explains the detox process - each step is accompanied by words of advice or examples from her own life, as well as holistic techniques to aid the detox process. Whether wanting to detox your body occasionally, or to detox for life, this is the only book you will need. Shazzie has put a lot of thought, time and energy into this book, to create the best detox reference around today! I just can't possibly say enough about how wonderful this book is. What a resource! Shazzie is from the UK. 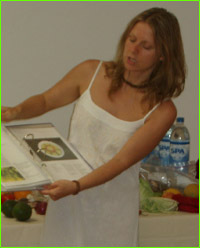 She teaches classes, writes books, has wonderful websites, and counsels people in raw foods living. This book reaches far beyond the scope of raw foods, offering insight into the many ways we can begin to achieve Total Health, including yoga, removing mercury fillings, meditating, creating a diary, research and info on topics like wild and organic foods, the hazards of fluoride and fluoridation of water, step by step fasting instructions, how to take care of your teeth, a first-timer's three day detox plan, descriptions of different types of body work and healing spa therapies including laughter, the skinny on alcohol, coffee and skin care, how to detox your wardrobe, and delicious recipes I can't wait to try! She also goes through all the detox symptoms one is likely to experience when transitioning to a raw diet, and helps you to do so gently. There's a resource section in the back and a separate recipe index for ease of reference. Detox Your World is simply one of those "must have's" for the health book section of your bookshelf. And Shazzie is a gorgeous and shining example of health, as you'll see in the cover picture. By sharing her before and after pictures, she invites us to know that she has undergone a transformation by practicing what she preaches. To subscribe to Laura's weekly newsletter, send an email to her with the words SUBSCRIBE TO WEEKLY E-ZINE in the subject line. "This book is a handbook of information for the person seeking a more healthier lifestyle. It provides a wealth of practical knowledge on how to get rid of the nasties in life in order to attract a higher level of health -- and lets face it, in today's society we need all the help we can get. By providing reasons why you should change your habits you may be shocked at how much you are poisoning yourself and the benefits you may acquire by changing your ways little by little. Shazzie opens up a new way of thinking that will change your life for the better. Detoxing is not just about diet, there are many things that we can do to create a better environment for ourselves and others and Shazzie, in her lively and realistic style, shows you how it can be done. You can follow some of her detox plans or else you can use the book to look at areas in which you can improve. We all know deep down that health is vital to enjoying our lives fully, when you start to acquire a new level of health, you start to enjoy a higher level of life. So don't delay -- life is too short. Get the knowledge -- get the goods -- get the picture: before it is too late. What a wonderful book. Well done, Shazzie. This book is going to have a great impact on people's lives." I often get asked which is the best way to purify water. My answer is that, if you can't afford an expensive purification system, the easiest thing to do is to buy a jug filter and charge the water as best you can. Water is the carrier, it carries messages, so any messages you put on the filter jug will also be entering your body. You can write messages such as "love", "world peace", "abundance for all", "i am in perfect health". So what do I do to my water? Well, I have a crock, and I have various crystals and contraptions sitting in the crock. I have angelic invocations and reiki symbols taped to the outside of the crock. And what is the one book I have sitting under the crock? What is the one book that contains all the information needed to make sure my water is the healthiest water in the world? Detox Your World, by Shazzie of course. "From what I have read so far I have to say it is an excellent book, one of the better books on raw foods and a great manual for assisting in the detoxification process. It contains lots of cool information, fun recipes and practical plans for assisting in the healing process using living foods. The best thing about the book (to me at least) is that it seems extremely versatile and can be helpful to someone at almost any stage or perspective on this diet (and even those not on this diet!). First, it provides lots of basic and introductory information that will be really beneficial to those just getting started in raw foods. Secondly, it has lots of info and philosophy that even natural hygienists would like to hear about. At the same time it doesn't limit itself to hygiene and gives some possible natural remedies along the lines of what animals do out in nature. Lastly, I have been raw for a while and am really into all of the science of it and so many of the more basic books aren't that interesting to me. But this book surprised me by throwing out some really cool and different info that I hadn't heard yet from David Wolfe, Gabriel Cousens, Dr Jubb, etc. All in all, I would say that it is a very good book and recommend it to anyone looking to learn more about the detoxification process, particularly as it pertains to a living foods diet. Take care everyone. PS -- I also had chance to meet Shazzie in person over the weekend and was very impressed by how nice and friendly she was. She is truly an a great spokesperson for eating living foods and I am grateful for the experience. Getting around so much lately has made me realize and appreciate the number of amazing people on this path and I encourage those who are struggling to have faith and stick with it -- there's lots of light at the end of the tunnel!!! You don't even have to be far along before you start seeing it." "Detox Your World brings forth a calm, holistic understanding of health, healing, detoxificiation, transformation, and raw-food nutrition. This book is filled with clever insights by the United Kingdom's most inspiring health author and speaker. Shazzie has made the impossible probable as she describes how she rejuvenated her mind, body, and spirit. Certainly, this is one of the best books in the entire health field." Founder of The Fruit Tree Planting Foundation. "Detox Your World is the most comprehensive book I've seen on the raw/living foods lifestyle since The Sunfood Diet Success System and Conscious Eating." "I had been high raw for about 18 months before doing the three day detox in Detox Your World. I felt much lighter for it and it made me realise that I was further along the raw road than I thought I was. I didn't struggle with it, it seemed really natural to do. I've been able to incorporate a lot of the ideas that you suggested into my everyday life now. The book is very clear, easy to use, a practical step by step approach and everybody will get something out of it in their raw life." Thank you so much for writing that book. It was such a joy to read your book that I gulped it down very quickly. Everything you said made so much sense. One of my friends here where I teach saw the cover of your book and asked what it was. I told her and she said... "Well we all should look so good as her. She's a model, right?" I told her the picture was of the author of the book, showed her the before and after picture of you, and she kinda got silent and didn't say anymore. Made her think maybe? It's great how some people are starting to ask me about what I'm doing to look so good and I have you and Kytka (Waldorf Homeschoolers) to thank for it. You two were the ones who really determined my desire to start this path (and maybe an end of winter craving for summer fruit *laughs*). Thank you ever so much for the book Detox your World. The world wouldn't have been quite the same without your sunshine in it! I want to tell you that I am about 20-30 pages into your beautiful book and you have rekindled the raw fire inside of me! I have been aware of the concept of eating only raw foods for 1.5 years. Over that time I have gone back and forth and back... Upon reading your book I suddenly am reminded of all of the beautifully inspiring reasons for living this way. I can honestly attribute my current and many future successes to all the inspiring people here and expecially your journey in finding the truth in this chaotic mess of a world. Thank you from the bottom of my heart. Hi Shaz, what a book!!!!! I knew it was gonna be good but it's *phew* the best! You've done an absolutely flipping(!) good job!! Well done, it's a classic. And I ain't saying that just because I love you! It's brilliant. A full and comprehensive wholsitic lifestyle book, full of inspirational suggestions, factual info, recipes and several detox plans to fit even the busiest agenda. This book is a gift -- so many times I have been frustrated not having a book which I can truly recommend to clients without losing them all after the first session!!! I have been seeking something professional enough and yet not too whacky. THIS IS IT. The wrapping and content of this book is enticing and full of excitement. This book held me all the way through and its near 400!! odd pages. I felt personally re-inspired and had a few questions answered too. It reminded me that we are all forever students of life. Detox your World is a expression of harmonising livelihoods and service -- sharing of facts without undue controversy. The testimonials were amongst the best I have read. I was moved by this book -- deeply moved. It has also given me an insight into how much work goes into creating and offering a service with so much information and inspiration without becoming boring at all. For me it supersedes all the books I have read. I feel totally comfy with insisting that all my clients buy this book. I feel delighted to now have a book that I feel proud and joyous to give and share with friends and family too. A book that guides people through transformational choices and seeks to invite the best from each person. I felt a deep appreciation and a realisation that to talk about this book would be a joy and a sincere expression of pride in our syster. Its already vibrating with a powerful potential of touching families and all beings who seek wellness of life. "...I love all of your sites and you have inspired me greatly. I am looking forward to your book." "I was so excited to see that your creating a new book! I'm a collector ( a hobby really) of raw food books and out of all the zillions :) of books I have... I love yours the best! You're so inspiring with your recipes, eye candy designs and your own personal transformation which has helped keep me on my raw journey. Thanks Shazzie!" If you would like to add your quote, please contact us! Many people ask if they can distribute this book, and we have resellers throughout the world. If you would like reseller information, please go to our wholesale page and follow the instructions.